Most wedding photographers will advise you on the shots you need and choose the best place and time to proceed. This can either be outside the Church or at the reception venue. The photographer will probably choose the best location based on the lighting conditions rather than the background - there is nothing worse than all the guests squinting into the sun! The number of formal group shots required really depends on a couple of factors. How important these kind of photos are to you. 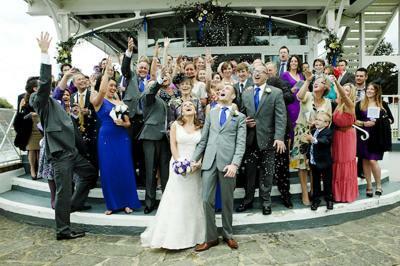 The style of wedding photography you have booked. The amount of time you want to spend posing for photos. If you allow about 4-5 minutes per photo then you can see that 10-15 group shots will soon eat into the time. Large group shots take longer to set up than small groups of 4-5 people. A reportage wedding photographer will probably only want to spend 25mins shooting formal groups so a cut down list of about 6-8 groups shots will work best. B+G with Bridesmaids, best man and ushers. These shots would be considered essential at most weddings but won’t take hours to shoot. This kind of list will obviously take make much longer and you have to remember that the photographer won’t just shoot 1 or 2 frames of each group. The more people in a group then the more chance there is of ruined shots due to blinking or distractions, so they’ll need a bit of time to make sure the shot is good. If you want a group shot of all the guests it may only be possible at a suitable venue - ideally, the photographer will want to shoot from a high vantage point like a first-floor window. The Best man and Ushers should be briefed to help the photographer round up the people required for each shot - this will save time and allow your photographer to concentrate on the photography.